Get some historical perspective at Temple of Poseidon and Erechtheion. 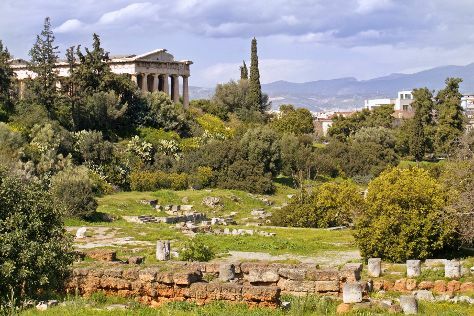 Do some cultural sightseeing at Monastiraki and Ancient Agora of Athens. You'll find plenty of places to visit near Athens: Vouliagmeni (Astir Beach, Vouliagmeni Beach, & more), Marathon Lake (in Marathon) and Vari (Scuba & Snorkeling & Yabanaki Beach). The adventure continues: take your sightseeing to a higher altitude at Mount Lycabettus, appreciate the extensive heritage of Athens Walking Tours, enjoy the sand and surf at Glyfada Beach, and do a tasting at Papagiannakos Winery. To find ratings, photos, reviews, and more tourist information, use the Athens trip planner. If you are flying in from United States, the closest major airport is Eleftherios Venizelos International Airport. In September, plan for daily highs up to 84°F, and evening lows to 67°F. Finish up your sightseeing early on the 27th (Wed) so you can travel back home.